Rhubarb is one of my favorite spring fruits. I can't really count strawberries, because they don't usually ripen until July. So they would technically be summer fruit, right? I get so excited when the funny looking rhubarb leaves start popping out of the ground in the spring. Then, I realize that it's still going to be another two months before I can actually harvest it. But that is okay, because it is well worth the wait. This year, my rhubarb patch did have a larger yield than last year, since I transplanted it last year (? ), but I still never have enough for what I want to do. I managed to make this pie, a strawberry rhubarb pie and my favorite rhubarb jelly, but the 5 pounds needed for the jelly wiped my patch clean. Luckily, an in-law of my husband's guided us to a patch on some family land that is not being used. So I hastily ran over there and cut as much as I could so I can make my beloved stewed rhubarb. There is nothing better than opening a canned jar of fresh fruit in the middle of winter. But, I digress. This was the first time I think, that I have ever made a custard pie. I had actually made it for father's day as a treat for my husband. I had already made the classic strawberry rhubarb pie, so I wanted to change it up. And I couldn't think of a better time to try out the new cookbook I had bought this spring. A cookbook all about pies? Heck yeah! 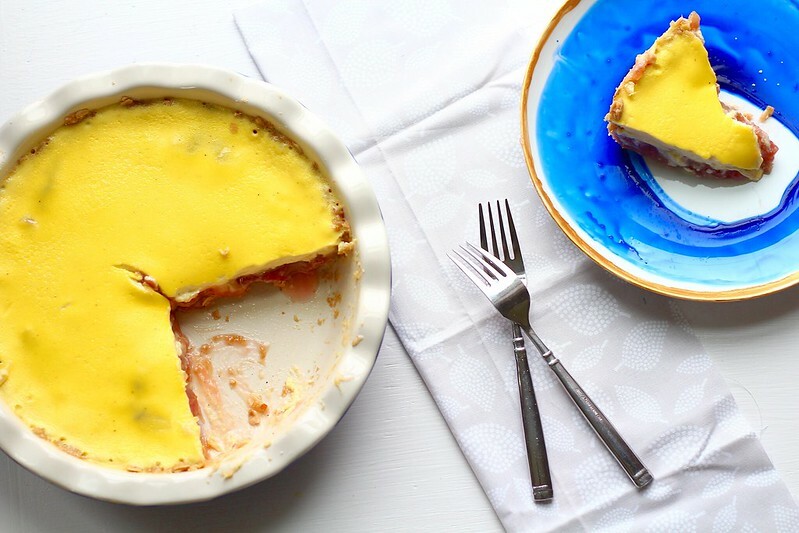 Don't be intimidated by the custard, because it comes together really quickly, and it goes with the rhubarb really well. The custard is really quite simple actually. 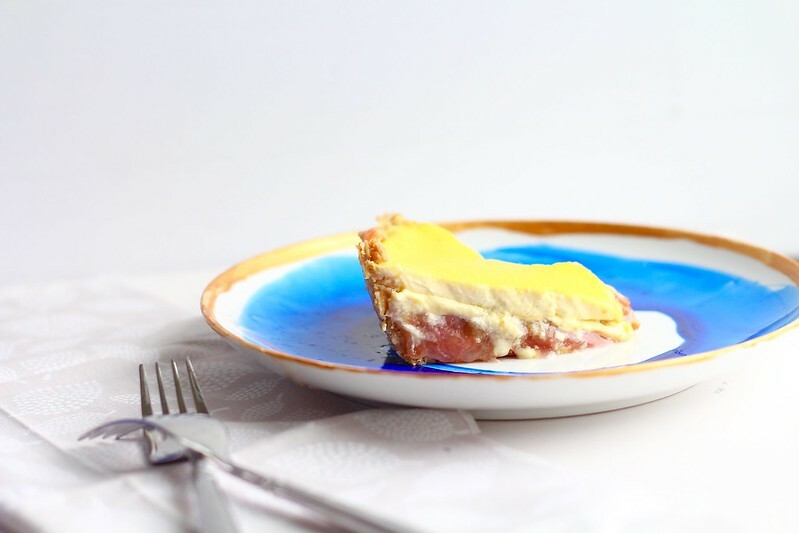 You basically just whisk the liquid ingredients in a bowl, then pour it over the pre-cooked rhubarb, throw it into the oven and voilá, you have yourself a delicious and creamy pie. And don't even get me started on the oat crust. Ohmmggeee, it is SO good. Nothing like changing up the usual, right? To make the crust, whisk all the ingredients, except the butter, together in a large bowl. Sprinkle the butter pieces over the top, then rub the butter into the flour mixture with your fingers until the butter is incorporated and there aren't any pieces larger than peas. Press the mixture evenly into a 9-inch pie pan, across the bottom and up the sides. Place in the freezer for 15 minutes. Meanwhile, preheat the oven to 350ºF. Place the frozen pie crust in the preheated oven and bake for 18-20 minutes. If the crust slumps on the sides, gently press it back together while still hot. Let cool completely before filling. To make the pie, preheat the oven to 325ºF. In a medium saucepan, combine the rhubarb, 3/4 cup of sugar, cornstarch, and 1/4 teaspoon salt. Cook over medium heat, stirring occasionally, until the rhubarb has cooked down into a thick sauce, about 10 minutes. Set aside. 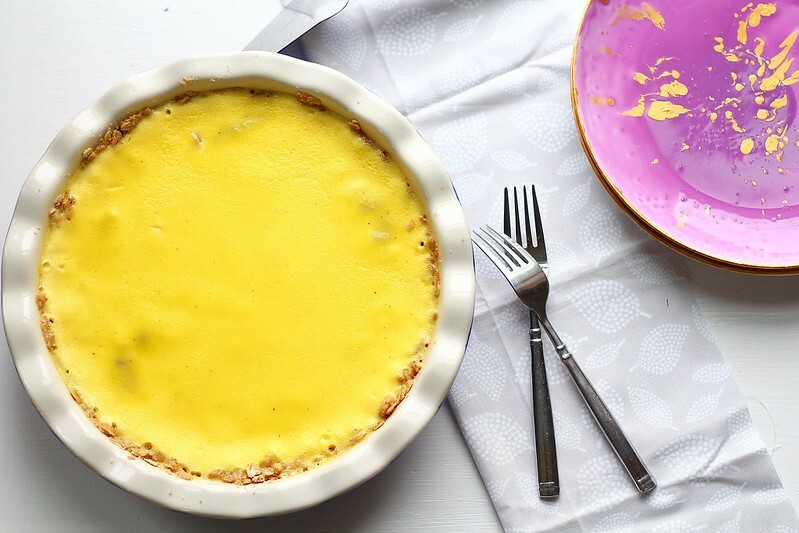 To make the custard, combine the remaining 1/2 cup sugar, remaining 1/4 teaspoon salt, heavy cream, sour cream, nutmeg and vanilla extract in a large bowl. Whisk until smooth. Whisk in the eggs, one at a time, until smooth. Spread the rhubarb mixture in the pre-baked pie crust evenly over the bottom. Strain the cream mixture through a fine-mesh sieve directly over the rhubarb. Place the pie on a baking sheet, then place in the preheated oven. Bake for 25-30 minutes, or until the edges are set, and the pie is no longer liquidy in the middle. Remove to a wire rack, and let cool for 2-3 hours before serving. Serve with freshly whipped cream or vanilla ice cream. The pie will keep well covered in the refrigerator up to 2 days.